The first EuroBasket Women teams to qualify for the Qualifying Round are the Slovak Republic after beating the Czech Republic (85-70). Spain made it two wins in two days and are joined by France, Latvia and Russia as second day qualifiers. The Slovak Republic have beaten the Czech Republic for the first time since 2001. Zuzana Zirkova (left No. 7), who was a member of the Slovak team that won eight years ago, was the leading scorer this time around with 18 points in the (85-70) victory. The Czech Republic played well during the first 20 minutes and hit 5-of-7 from beyond the arc. However the Slovakian players dug deep and went into the interval level (35-35). The Slovak Republic played better defensively in the second half of the match and took the lead for good after a Martina Gyurcsi jump shot (46-45) with 26 minutes played. A Zirkova three-pointer (55-47) with eight minutes left to play put her side firmly in the driving seat. 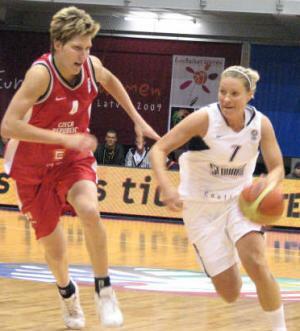 The Czech Republic relied heavily on the experience of Jana Vesela and Eva Viteckova who scored 14 and 12 points each. Yet this was not enough to avoid defeat. Zirkova was supported offensively by Gyurcsi who finished with 11 points and 9 rebounds. The other player in double digits was Lucia Kupcikova with 10 points. Spain remain unbeaten after beating Ukraine (85-59). Spain scored the first 8 points of the game and appeared to be cruising with three minutes played. However they took their foot off the accelerator. Hence the Ukraine came into the game. Spain edged the first period (15-13) and then became more disciplined as they stretched their advantage by the interval (39-26). During the second half Spain controlled the pace of the match and were never in any danger of losing the game. Six Spanish players finished in double digits with Silvia Dominguez leading the way with 11 points. Cindy Lima, Anna Montañana, Lucila Nicholls, Laia Palau and Laura Pascua all scored 10 points each. Iryna Biryu scored a game high 16 points in defeat. Latvia made it two wins from two matches after beating Hungary (76-59). They have booked their ticket for the rest of the competition. Anete Jekabsone-Zogota led the scoring with 25 points and Zane Tamane contributed 20 points. The only other player in double digits was Gunta Basko with 14 points. Latvia took the lead for good after four minutes and were not really troubled for the rest of game. For Hungary Anna Vajda scored 16 and Anna Vida 10 points. Greece ran out of energy in the last minute and allowed Poland to come back from far to win the game (62-60) with Magdalena Leciejewska picking up an offensive rebound to score the game winning shot. Evanthia Maltsi was once again the driving force for Greece with 21 points. Poland's leading scorer was Ewelina Kobryn with 17 points. She also had 12 rebounds. Justyna Jeziorna added 13 points and Magdalena Leciejewska finished the game with 12 points and 12 rebounds, while Daria Mieloszynska scored 10 points. Nevin Kristen Nevlin from Turkey secured victory for her team with 4 points and 2 blocks in the last 64 seconds of their match against Lithuania (69-66). Nevlin finished the match with a double-double of 18 points and 10 rebounds. She was supported offensively by Saziye Ivegin who scored 12 points. Birsel Vardarli had a good all-round game with 11 points, 5 rebounds, 9 assists and 3 steals as Turkey recorded their first win in this competition. Egle Stakneviciene came off the bench for Lithuania and scored 30 points, which included 5-of-10 from behind the arc. She also took down 10 rebounds. Agne Ciudariene also had a good game offensively with 16 points. She also had 8 rebounds and 3 steals. Sandra Vuluzyte was looking strong in the first half of the match with 10 points but only managed 2 points during the second half of the match. Lithuania rely on a few players and in close games these players are required to be on form for 40 minutes. Turkey went all out early on and went on a 11-0 run to lead (14-2) after four minutes. Lithuania were then forced to chase the game. Turkey led (25-13) after the first period but were outplayed during the second quarter and went into the interval trailing (36-40). Lithuania's stranglehold on the game ended after 23 minutes with them leading (45-38). Turkey slowly reduced the deficit and went ahead briefly before finishing the third period trailing by a single point (50-51). The lead changed hands on several occasions during the final period until Saziye Ivegin fired a three-pointer for Turkey with 90 seconds left to play (65-64). Nevlin did the rest as Turkey hung on for victory. Both teams are at the moment 1 and 1 and have to wait until Tuesday to know if they continue in the competition. Two years ago, during EuroBasket Women 2007, Serbia surprised Russia with Milica Dabovic scoring 15 points in the final quarter to hand Russia their only defeat of the Championship. Serbia were not able to repeat this victory as they were completely outclassed this time around. Russia won the match (72-37) with all 11 players on the team sheet scoring. Russia led (11-0) with four minutes played and ended the game as a contest by the interval (32-16). Russia have qualified for the next phase of the competition while Serbia's fate lies in their hands in the final group game on Tuesday. France made things difficult for themselves and required overtime to beat Belarus (63-61) to qualify for the next phase in the 2009 Eurobasket Women. You can read our match report here. Italy keep their hopes alive for qualification for the next phase of the European Championship after beating Israel (75-64). Italy did all the damage in the first period as they outscored Israel (32-10). Despite Israel recovering their composure in the second quarter and although they did all they could to bring down the deficit they basically ran out of time and luck. Former LFB player Lad Suez Karni led the Israeli attack with 18 points. 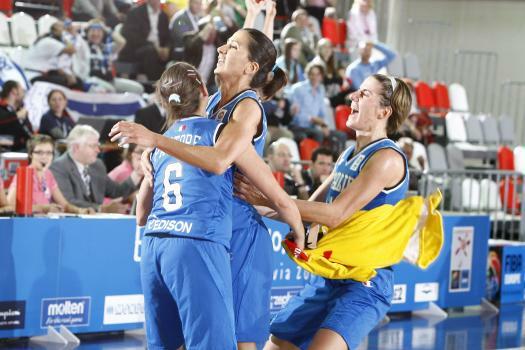 For Italy Raffaella Masciadri top scored with 23 points.